If you thought metal boats were a thing of the past, think again. 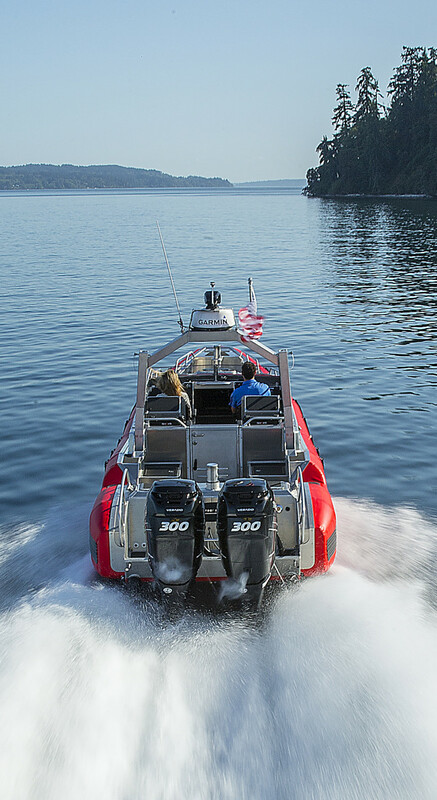 A heavy-gauge aluminum beauty from Life Proof Boats of Bremerton, Washington. Not so long ago, building custom yachts was the playing field for folks with extra-deep pockets and a need for a vessel three digits long. The rest of us bought off the rack. But production boats are getting darned expensive these days, pricey enough for some shoppers of mid-sized, or even smaller, boats to consider building custom instead. Custom building gives you exactly the boat you want, with just the equipment you want and nothing you don’t. 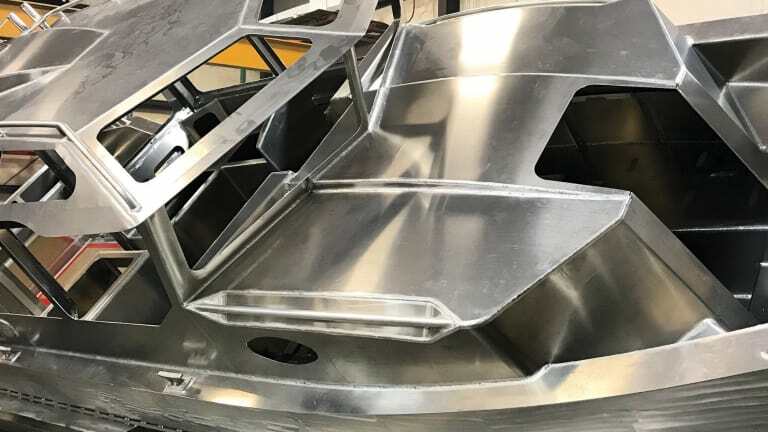 And when you’re thinking of building a custom boat of any size, I think you should also be thinking of building in metal, either aluminum or steel. For most people, it’s aluminum, but both materials are better suited to building one-offs, and both have advantages over the techniques practiced in most production manufacturing facilities these days. The creation of a top-shelf metal boat demands a near-artistic level of welding expertise. Steel and aluminum, by the way, were both popular boatbuilding materials from the end of World War II until the fiberglass revolution of the 1960s. Check out the Chris-Craft Roamer models of that period, built first in steel, then steel and aluminum and finally just aluminum, up to 73 feet long by the time Roamer closed up shop in 1979. (Over the years, Chris-Craft has built boats in planked wood, plywood, steel, aluminum and fiberglass.) By the mid-1970s, fiberglass was the material of choice for production boatbuilding and has now become so dominant that many shoppers never consider a boat of any other material. But there are still a few companies building nice production boats in metal— you just have to look a little harder to find them. Or, as I’ve just noted, you can build a custom boat, either from plans you commission from a naval architect or from stock plans. Computer-Aided Design (CAD) has made building in metal easier, faster and less expensive. 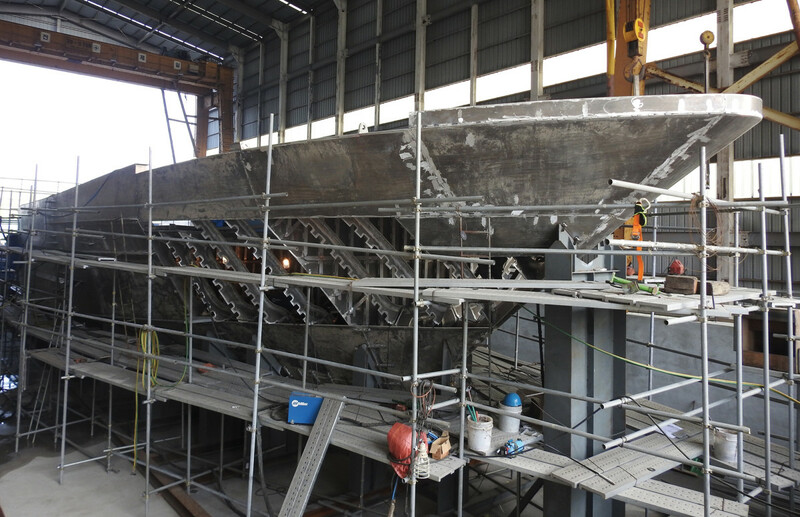 There’s no more laborious lofting (drawing the vessel’s lines full-size on the shop floor so the builder can determine the shapes of the various structural components), no time-consuming cutting out of pieces by hand. Today, the yacht designer, working on a computer, creates a cutting file defining the shapes of all the pieces; this file is fed to a CNC machine at the metal shop, which then cuts out the parts automatically and sends them to the builder. From there, it’s like assembling a kit—probably not something you or I want to tackle in the backyard, but an everyday project for a competent metal boatbuilder. These aluminum beauties sport foam-filled, RIB-like collars that make ‘em unsinkable. What are the joys of metal boats? And are they even worth the effort, when the market is teeming with fiberglass? First, they are tough. If you hit something, chances are it won’t hurt too badly. Both aluminum and steel are abrasion-resistant, a far cry from the fragility of gelcoat. 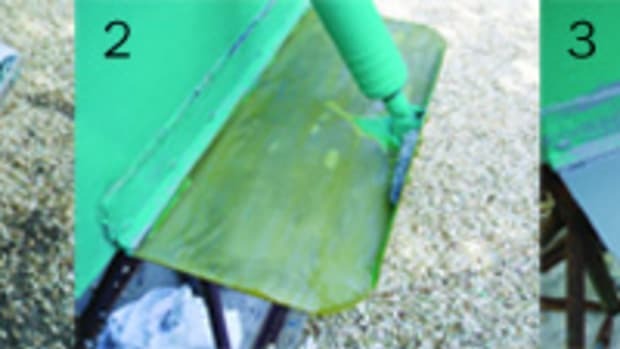 If you miss with the fenders and manage to scratch a steel hull, slap a little paint on it ASAP so it doesn’t rust; scratched aluminum will heal itself by growing a thin layer of aluminum oxide. If you grind on rocks or a reef in a metal boat, with any luck you won’t punch a hole in the bottom—dent it, maybe, but at least the boat won’t sink under tow to the yard. Repairs in metal are as good as new: Cut out the damage, weld in new plates and the repair will be just as strong as the original. There’s no worry about the new laminate bonding to the old as with fiberglass repairs, no fiddling with ersatz molds or backing materials to form the fiberglass fabric into the correct shape. 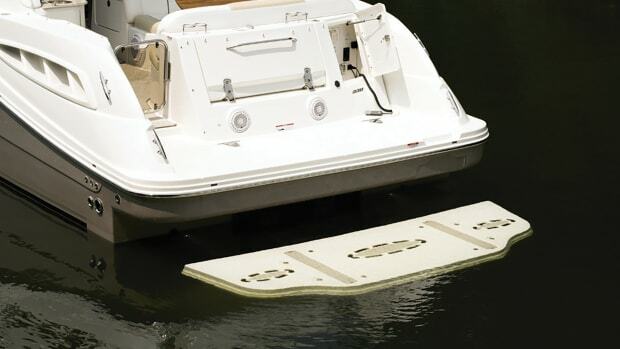 And while metal boat owners might worry a bit more about corrosion, they’re not concerned with osmosis, delamination or other problems due to manufacturing defects. Moreover, the toughness of metal takes a lot of the angst out of docking. Caught in the current of New York Harbor’s Buttermilk Channel, I once whacked the end of the pier at the Coast Guard base so hard I thought for sure it must have registered on the Richter scale. Quite embarrassing. But the steel oil boat I was piloting at the time bounced off without even chipping the paint; the pilings suffered more damage. After a couple years running this boat, followed by a couple years running a big steel passenger schooner, fiberglass felt comparatively fragile when I made the switch back to yachts. I’m starting to plan my retirement boat, the one I’m going to live aboard on the Intracoastal Waterway. Since I’ll be getting old and losing my eyesight, I’ll probably hit things, and for that I want a steel boat, even though common sense says to go with aluminum. “Aluminum is a third the weight of steel, and half as strong,” said yacht designer and shipbuilder Bob Derecktor when, many years ago, I asked him to compare the two metals. What Derecktor didn’t know about boatbuilding in aluminum and steel—and wood, too, for that matter—wasn’t worth knowing. He started his first yard in 1947 in Mamaroneck, New York, and even though Bob’s gone now, Derecktor Shipyards in New York, Florida and Maine are still building and repairing yachts, workboats, high-speed ferries and military craft. Metal boats are often assembled by aligning a series of computer-cut components (above) and then sheathing them with panels of plate material (below) welded using special techniques. According to Derecktor’s rule, to match the strength of steel in aluminum means doubling the scantlings—using 3/8-inch aluminum plate rather than 3/16-inch steel, for example. That doubles the weight of aluminum, but it’s still only 2/3 the weight of a comparable steel vessel. Certainly, you’re dealing with a rule of thumb here, and like most rules of thumb it’s only an approximation, but I think it’s pretty close. 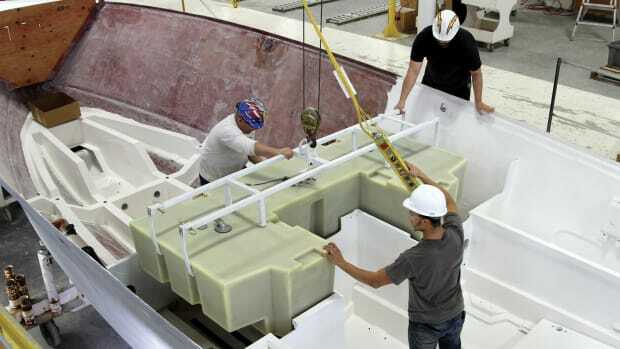 Some experts estimate the structure of an aluminum boat will weigh around 50 percent that of a steel boat of the same strength—maybe, but the point is, an aluminum boat, in its structure, is substantially lighter than one built in steel. Or, a builder can match the weight of steel in aluminum, and produce a boat that’s quite a bit stronger, bearing in mind that the weight savings is in the ship’s structure, not the finished vessel. The weight of engines, joinery, systems, appliances and so forth makes up a big part of the final displacement of the vessel. 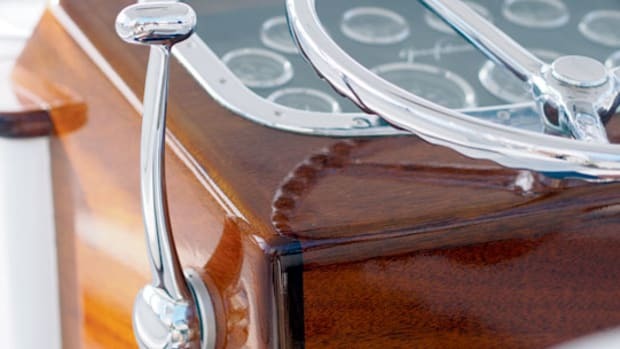 Of course, whether you go with aluminum or steel, I’m sure you realize at this point that custom boatbuilding in metal, despite its increasing allure these days, is a relatively dense and multifaceted topic. So, having now covered the basics, Below I’ll delve into some of the more advanced aspects of the subject, including a process that almost magically combines both steel and aluminum in one, singular vessel. Even if you build in aluminum, plenty of fairing work is necessary. Above, we dealt with the basics of custom boatbuilding in metal, a sensible alternative to the industrialized creation of production-type boats which are, undeniably, getting more and more expensive these days. 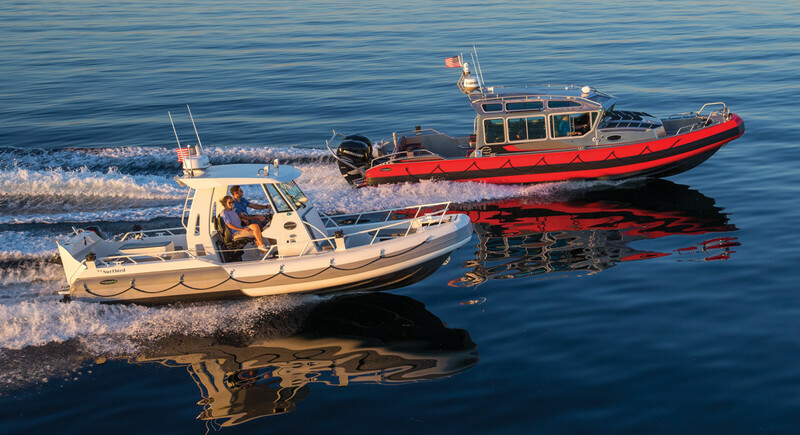 Modern techniques make metal boats simpler than ever to build, whether in aluminum or steel, and the completed vessels tend to be tough, abrasion-resistant and easily repaired. Moreover, both metals—whether we’re talking steel or aluminum—have their comparative advantages. Steel, for example, is much cheaper to buy, but aluminum is easier to handle, easier to cut and faster to weld, so the added cost can be offset by labor savings. With either material there’s a lot of prep work necessary to create a yacht finish—grinding, filling and fairing before the topcoat’s laid on—which adds substantially to the cost of the completed vessel. The folks at Palmer Johnson once told me they figured on eight months to prepare a new 150-foot aluminum yacht for painting. 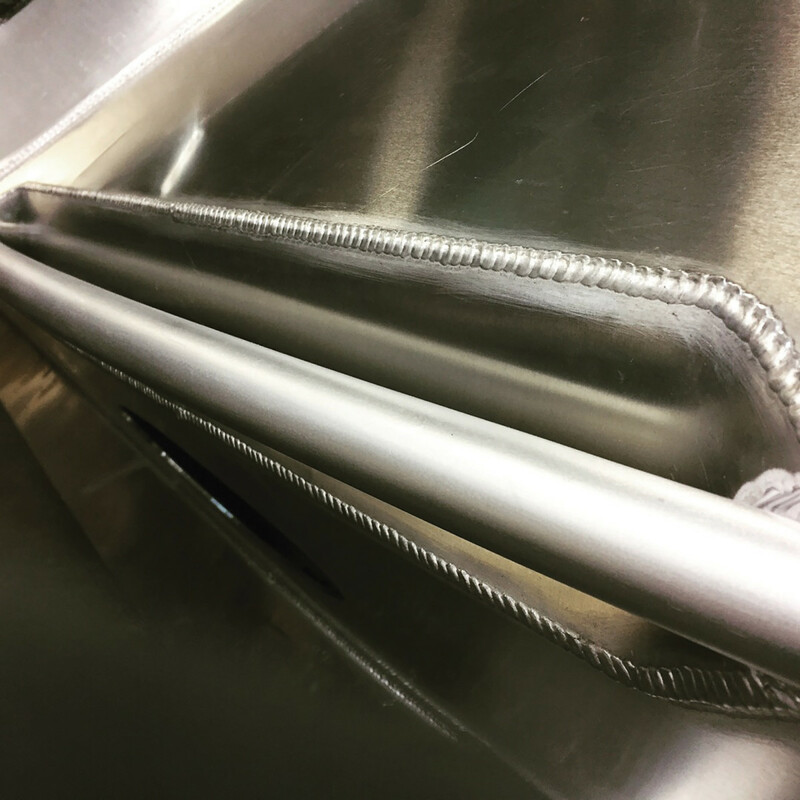 Steel takes even more work and time, because the shell plates tend to distort more during welding and need more filling and fairing. 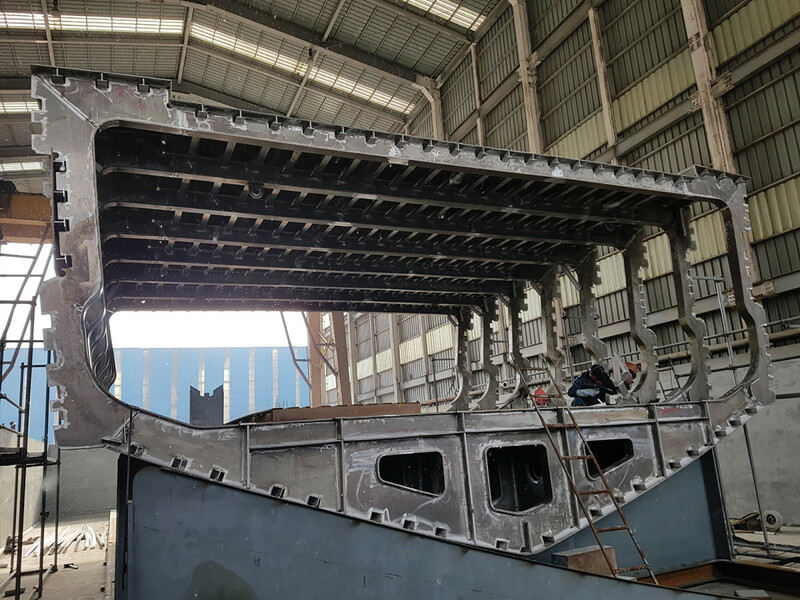 And steel has to be sandblasted and coated inside and out; you can leave aluminum alone forever, if you don’t mind a dull grey boat. Just paint the bottom. 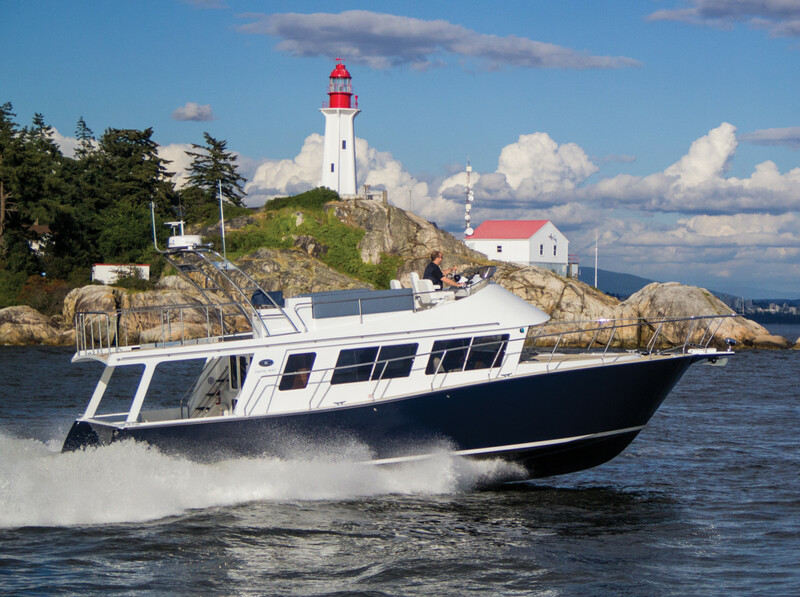 Canadian firm Coastal Craft builds exclusively in welded aluminum. Ships, military vessels and larger yachts are often built with a steel hull and deck, but an aluminum superstructure to save weight and improve stability. In the old days, the steel-to-aluminum joint was fastened with rivets, with insulation between the metals to forestall galvanic corrosion. Today, bi-metallic transition joints provide a bridge for welding the dissimilar metals together. Transition joints are made by “explosion cladding.” Essentially, the steel and aluminum are stacked together, along with an explosive powder. When the powder is detonated, the force of the explosion bonds the metals together instantaneously and permanently. The shipbuilder then welds the steel to the steel side of the joint, the aluminum to the aluminum side; there’s no galvanic action between the dissimilar metals. In shipbuilding, steel and aluminum transition joints are most common, but many other metals can be joined this way. Nobelclad is a primary maker of bimetallic transition joints. There are still some companies building fine production boats exclusively in aluminum. 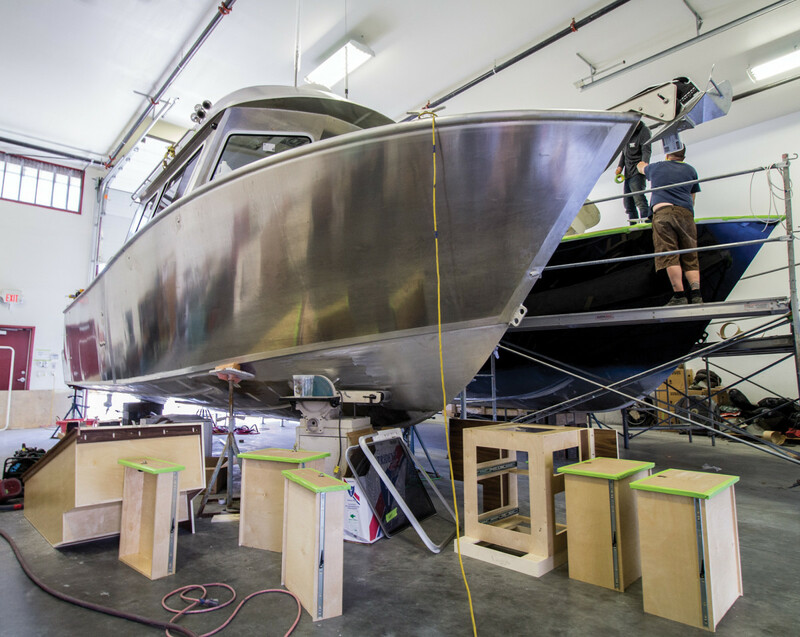 Coastal Craft, in Gibsons, British Columbia, builds welded aluminum boats from 40 to 65 feet. Many aluminum boats are, shall we say, idiosyncratic in their appearance, but the Coastal Craft looks like metal boats ought to: a nice combination of rugged and yachty. The folks at Coastal Craft maintain they were the first builder to install Volvo Penta IPS drives in an aluminum hull. Snake River Boat Builders, a consortium of companies in the Lewis-Clark Valley near Clarkson, Washington, call the area the “welded aluminum boat capital of the world.” Piloting the rivers in those parts is an obstacle course of snags, water-soaked logs, rocks and other hazards; there’s a reason these folks ride on aluminum hulls. Across the pond, Anytec builds some very cool-looking aluminum boats in Finland; only trouble is, the closest dealer to the U.S. is in Norway. Lund has been building aluminum fishing boats in America since 1948, although today they build some fiberglass models too. And, of course, there are scads of pontoon boats racing around lakes and rivers on aluminum tubes. And what’s boating without the armada of welded- and riveted-aluminum Jon boats and other small craft, popular from the bayous to the rock-bound coast of Maine to ice-clogged Alaskan waters? My first boat was one of these, and maybe yours was, too. Lowe, Crestliner, Tracker, G3 and Alumacraft are just a few of the manufacturers. 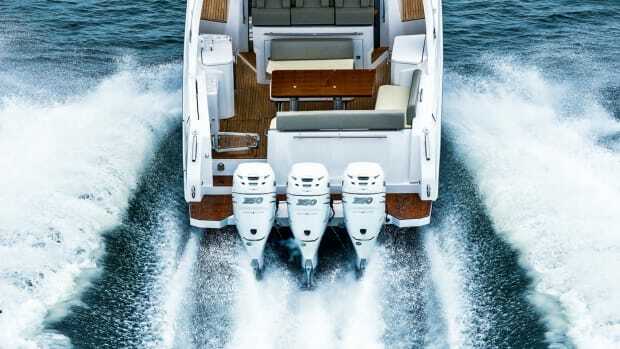 There’s a brand-new company in the U.S. ready to start production on a high-end aluminum center-console, one with accommodations for overnighting. Designed by Sparkman & Stephens and built by Lyman-Morse, the Rambler 38 will be composed using Rambler’s proprietary ExactForm process that, according to S&S Chief Designer and Rambler Yachts President Brendan Abbott, will create a yacht finish with minimal fairing. The bottom panels and hull sides are each made of one length of aluminum, welded in the traditional manner. Otherwise, the boat is fastened with adhesive, including the bottom-support, egg-crate grid. Gluing rather than welding eliminates distortion, and leaves fair surfaces for finishing. 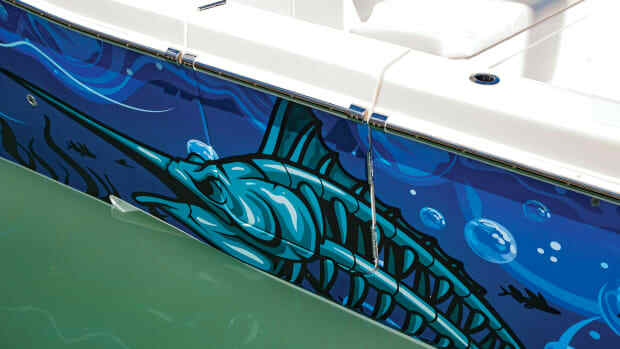 The topsides can be left bare aluminum, or vinyl wrapped, or painted with conventional linear polyurethane. 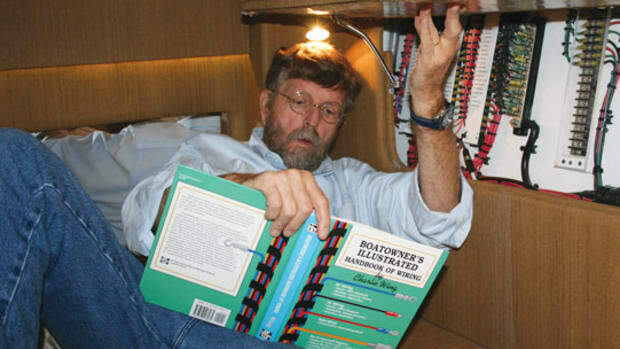 Abbott says the primary reason for building in aluminum is recyclability: The aluminum used to build the Rambler is 85 percent recycled metal; recycled aluminum is the same quality as aluminum coming straight from the mill, but recycling uses about 5 percent of the energy needed to produce aluminum from bauxite ore. At the end of the boat’s life, adds Abbott, 100 percent of it can be recycled and used again. And while there are ways to recycle fiberglass, most unwanted boats end up chopped up and in the dumpster. The Rambler 38 is built in a jig, without expensive tooling, so changes can be made easily. Abbott says it isn’t a big deal to shorten the hull, change the decks, etc. He has already drawn the plans for a 40-foot cabin model with inboards (the 38 is multiple-outboard powered), and is working on the concepts for even bigger models. Hull No. 1 is set to launch later this spring. If none of the above works for you, however, find someone with plans. 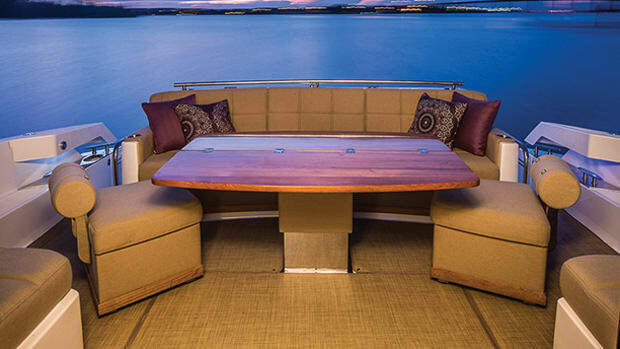 Most yacht designers have a catalog of stock plans, and many sell them online; one I like is Michael Kasten of Kasten Marine, who has yachts designed for both steel and aluminum construction. Dix Design’s Dudley Dix is another good source. Both Kasten and Dix have scads of good stuff on their websites that will keep a boat nut reading for hours. Surfing around their websites is almost as much fun as owning a boat. But not quite. So, next time you’re ready for something new, why not think about custom building? And while you’re at it, build a metal boat. Whether you pick steel or aluminum, once you skipper a de-plasticized yacht, you’ll never go back. This article originally appeared in two parts in the December 2018 and January 2019 issues of Power & Motoryacht magazine.